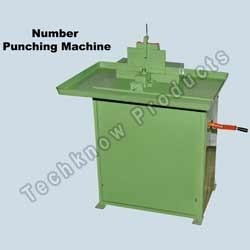 We are one of the high-spirited Number Punching Machines manufacturer, proffering number punching machine. Our number punching machine has many more salient features. These machines are widely used in Brass Part, Copper or Aluminium metals number punching. Backed by the experience from 1971, we have established ourselves as a prominent manufacturer, supplier and exporter of a broad array of Industrial Machines. This range of products comprises Turning Machine, Threading and Tapping Machine, Double Head Slotting Machine, Rod and Section Cutting Machine, Billet/Rod Cutting Machine, Milling Machine, Hinges Slot Machine, Wire Draw Machine, Double Head Turning and Threading Machine, Light Slot Machine, Number Punching Machine. All products are fabricated using premium quality raw material procured from eminent merchandisers. These products are widely admired for their ease of installation, high efficiency and low maintenance. Owing to our large production capacity, we have been able to cater to the diverse demands of our widespread customers. Quality has always been the spot of attention for our organization. Therefore, we strive hard to deliver an impeccable range of machinery to our customers. Moreover, we are backed by an ultramodern manufacturing plant, we are able to make a timely delivery of the client's order. A sophisticated and sound warehousing department enables us in bringing consistent improvement in our methodologies and techniques. All are our endeavors are intended to meet specific client's requirements. It has helped us in acquiring a huge clientele throughout the country.